The Holidays are here! Time for celebrating with our friends and family. I love to dress up for parties, but I don’t love carrying my large handbag with me. Luckily, I have a new free pattern to share with you that gives me a small clutch handbag that is perfect for any special occasion. I love it, and I think you will too. 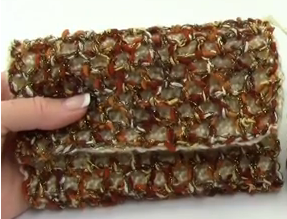 It’s called the Sparkle Mesh Clutch from Premier® Yarns. I worked mine in Premier’s Ever Soft, color Off-White, and City Life in color Golden to add just the right amount of sparkle. The skill level for this project is intermediate, but it’s an easy intermediate. Ready to get started? You can find the pattern here: Pattern. On the right-hand side of the screen you will see a button that says “Download Free Pattern”. You will click that button to download the pattern in Adobe format. You will also need a US Size H/8 (5 mm) (or size needed to obtain gauge), a yarn needle, matching thread, sewing needle, 1-1” button and 1-¼” snap. And here is my finished Sparkle Mesh Clutch! Isn’t it pretty? The gold sparkle is just right for any holiday occasion and the size is perfect for carrying just the necessities. I hope you enjoy making and using your Sparkle Mesh Clutch. We have another free pattern for a beautiful scarf that would look great with your new clutch. Check it out here. ‘Tis the Season For Crochet in Advertising!